There's always a place for fresh and frozen favourites inside the 21.3 cu. ft. top-freezer refrigerator. Finding food is easy thanks to energy-efficient LED interior lighting, and for more convenient storage options, the Flexi-Slide bin quickly moves side-to-side. An additional door bin helps you store more, so there will always be room for what you want, where you want it inside the top-freezer refrigerator. Plus, you won't have to fill ice trays in your apartment size refrigerator again with the compatible, easy-to-install EZ Connect icemaker kit (model no. ECKMFEZ2). Frameless glass shelves give your food a little more elbow room for wall-to-wall storage. Enjoy plenty of room for your fresh and frozen favorites with the 25 cu. ft. capacity large side-by-side refrigerator. You'll be able to cool food quickly with the Accu-Chill" temperature management system. And, for easy cleanup, SpillGuard" glass shelves contain spills and leaks in the side-by-side refrigerator. Plus, this large side-by-side refrigerator includes Adaptive Defrost that monitors compressor activity and defrosts only when necessary, saving you more energy. 30-inch W 20 cu.ft French Door Refrigerator with Ice Maker and Water Dispenser in White Find purposefully-designed storage zones for items you use most in this 30-inch french door bottom freezer refrigerator. Humidity-controlled crispers let you store fruits and veggies in their ideal environment while adjustable gallon door bins add loading flexibility when and where you need it. 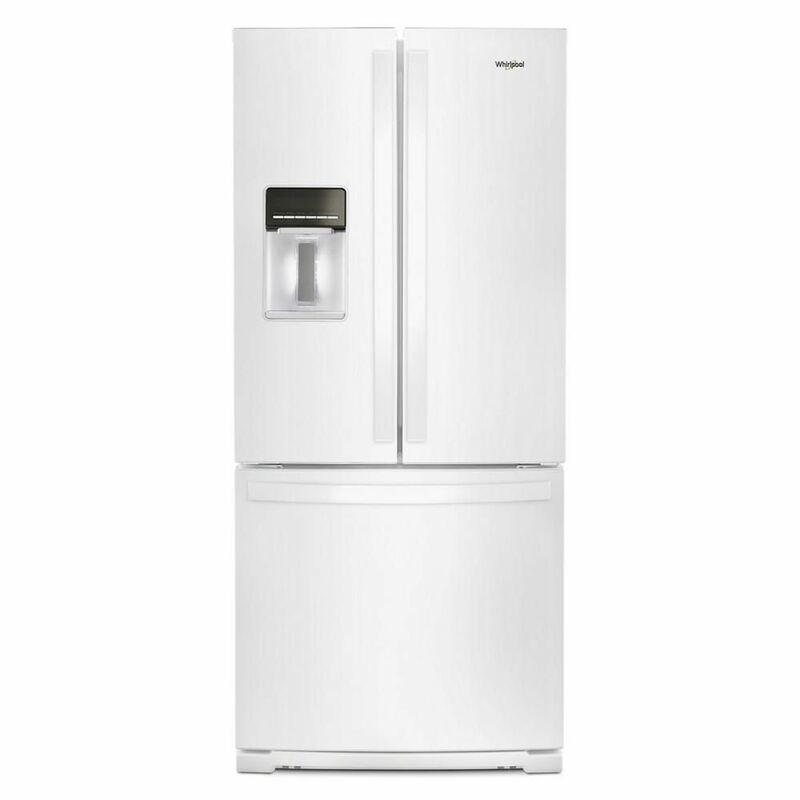 30-inch W 20 cu.ft French Door Refrigerator with Ice Maker and Water Dispenser in White is rated 4.4 out of 5 by 263. Rated 1 out of 5 by renee from First of all I would not say this is fingerprint resistant. Secondly, after only using it for 2 ... First of all I would not say this is fingerprint resistant. Secondly, after only using it for 2 months (August 2018)water leaking all over our kitchen floor, warping the hardwoods. Called Whirlpool, they sent out a local Appliance repair business to fix. Now here it is 8 months later and it is leaking all over again. Called Whirlpool and after 2 phone calls and over an hour on the phone someone will be out to repair again. Called on a Monday and they can not get anyone out for a week to repair. No time frame given when they will be out. NOT Happy at all. Our old refrigerator was over 20 years old and never a problem!!!! Would not recommend this model at all.